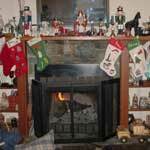 It's just not Christmas without stockings hanging from the fireplace mantel or placed under the Christmas tree. 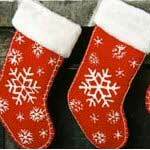 Christmas stockings are very special and personal since each family member has his and her own. They add to the home's Christmas decor and hold small gifts, plus fruits and nuts. You will discover that stockings can be extremely simple and easy to sew. There are picture stockings, ones made with beautiful rick rack, baby's first, traditional and many more. 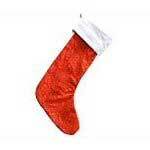 Give a gift that keeps on giving by making your loved ones their own stocking they can enjoy year after year. 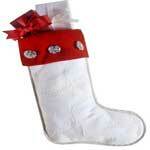 This red and white Christmas stocking is easy to sew and will add to your Christmas decor. 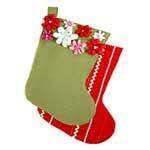 Easily personalize this felt stocking by applying rick rack, fabric flowers and other designs. Here are instructions for making a Christmas stocking that is shaped like a mouse. Involve your kitty in the Christmas festivities with his own special stocking. Get into the Christmas spirit by making stockings for the whole family. 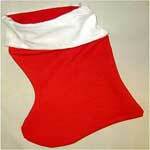 With just a few materials and this pattern you can make a lovely Christmas stocking in red and white. 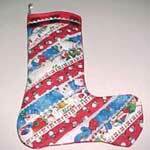 Gather up your fabric scraps and make a quilted Christmas stocking. Makes a thoughtful gift for someone special. 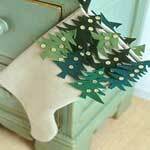 Unique stocking made of felt with green and teal colored cut outs of evergreen trees that line the top. Enjoy making this for someone special. Create a stocking for each member of your family. Personalize them by adding their name and other embellishments. 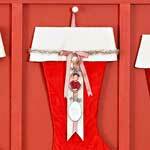 Here are detailed instructions in step by step format to help you make great looking stockings to add to your Christmas decor. Adorable stocking with silk bow and a picture of your loved one. Create this personalized stocking with just a few materials. Boost the Christmas spirit in your home with this easy to make Christmas stocking. 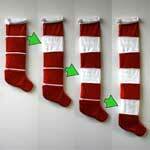 This stocking is designed to expand in length in order to hold more for those who have really been good this year. Here are four beautiful stocking patterns to choose from. Make one or all four to adorn your fireplace mantel or to give as gifts. This is a great stocking to make for the fishing enthusiast in your family. 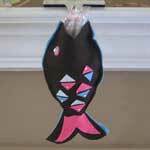 The stocking is shaped like a fish with an open mouth.